It’s Christmas time, so it’s time to talk about brands and Christmas and any discussion of brands associated with Christmas inevitably comes round to Coca-Cola and its part in creating the iconic image of Santa Claus as a jolly, white-bearded old man dressed in red and white. Many people believe Coke was the first to use this type of image. Unfortunately, rather like other Christmas myths, the truth is somewhat different. (Sorry kids). 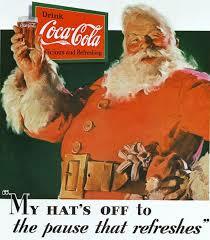 When it comes to a jolly Santa in a red and white suit, Coca-Cola was a me-too. Another brand beat them to it and the pioneer was actually another drinks brand, White Rock Beverages. White Rock Beverages takes its name from the White Rock natural spring in Waukesha, Wisconsin. The local Potawatomi Indians and subsequently the first settlers believed the waters had special medicinal powers that relieved a variety of symptoms. The spring became a destination for health-seeking vacationers. White Rock became America’s most recognized brand of water. It extended into Ginger Ale and other seltzers. It was chosen to christen Lindbergh’s “Spirit of St. Louis” prior to its historic flight, and across the Atlantic, it was served at the coronation banquet of King Edward VII. Then on December 19th 1915 in the run up to Christmas, it ran a black and white press ad in the San Francisco Examiner. 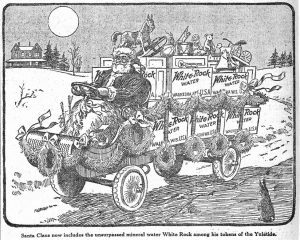 The ad showed a jolly old man dressed in what we would now recognise as a Santa suit and driving a soda truck laden with White Rock water. 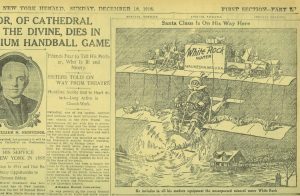 The following year Santa had upgraded his mode of transport and was now seen flying a bi-plane in an ad that appeared in The New York Herald on December 10, 1916. The world has to see the colour of that suit when White Rock ran an ad in the December 12 of Life Magazine with Santa resplendent in his red and white outfit. 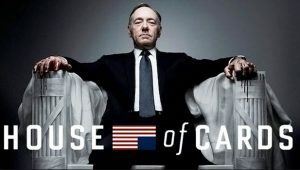 There is another interesting twist in the ad. Santa is sitting at his desk reading a letter and laughing. Perhaps not surprisingly there is an opened bottle of White Rock mineral water and a glass beside it, on his desk. 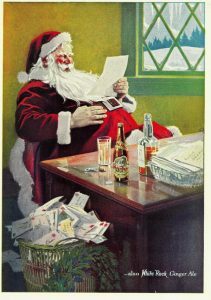 What is more surprising is that Santa also has an opened bottle of Whiskey on his desk. This was after all during the height of prohibition. Many see this as a not too obvious nod towards the fact that both soda water and ginger ale were popular mixers for the illicit liquors of that era. Clearly, White Rock felt that the North Pole and Santa were exempt from U.S laws. Coke’s association with a red and white Santa didn’t begin until 1931, when D’Arcy advertising executive Archie Lee convinced the company it needed a campaign that showed a wholesome Santa Claus who was both realistic and symbolic. So now, you know White Rock was the first to use this style of image, but it is fair to say that it was Coca-Cola who would really popularise the image around the world. A copywriter was walking to work when he passed a man sitting on the side of the street asking for money. A sign in front of a small bowl read “I am blind” but the bowl only contained a couple of coins. 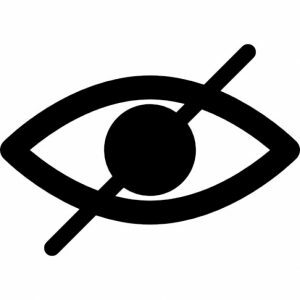 Perhaps not surprisingly, the blind man looked a little depressed. The copywriter thought for a bit and finally added a few words to the man’s sign. 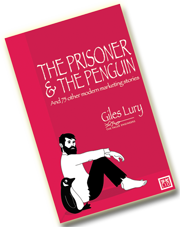 Walking back from work that evening, the copywriter saw that the man was still sitting by the side of the street but as he got closer, he could see the man looked happy and his bowl was full of money. He stopped to chat to the man again. The blind told him that not only had people given him more money than they ever had before, many had stopped and talked to him. He asked the copywriter what he had written on the sign. This is not my story. 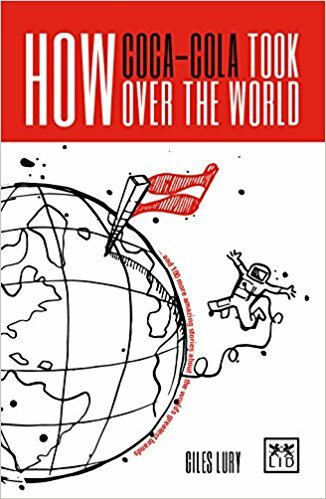 It is not a new story but when I saw a version of it quoted by Paul Feldwick recently in Campaign, the urge to retell a great story got the better of me. So, this is my version. For me, the story not only demonstrates the power of emotion and the power of a few carefully chosen words, it is an example of how the best stories travel through their telling and retelling. Please tell your version to whoever you want.